Green Stuff Remover is a 1-litre ready-to-use and 5-litre concentrated valeting product offered by the Power Maxed, vehicle care brand. Previously known as Caravan Wash due to its most common application on algae-prone caravans and motor homes, Power Maxed has renamed the product to help users connect the product with the problem it is best able to solve. Caravans, motor homes, any home feature built with UPVC and of course any vehicle left for more than a few weeks can begin to build an increasing layer of algae and even moss, which can be a messy and difficult job to clean. Bare gelcoat can suffer as can box-style trailers, which look unsightly. This is where Green Stuff Remover comes into its own. Rich in algaecides designed to tackle green algae, black streaks and moss build-up, this product is perfect for de-griming caravans, conservatories and derelict vehicles in desperate need of a clean-up. General detergent and degreasing properties offer an all-round deep clean making Green Stuff Remover a valuable asset for anyone who wants to convert a surface from a grimy, neglected, algae-riddled mess into something clean and shiny to be proud of. Non-caustic and silicone-free, there is no place this product cannot be used. A ready-to-use product in a 1-litre container, Green Stuff Remover comes with a spray trigger, which can be used to spray the product directly onto the surface to be cleaned, where it can be left to dwell and react before being wiped or rinsed away, taking moss, algae, black streaks and other contaminants with it. For particularly tough stains agitation with a soft cloth will speed up the cleaning process. The 5-litre product can be diluted 15:1, meaning that the container produces up to 75-litres of ready-to-use product. 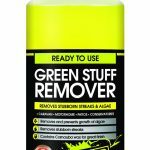 Power Maxed Green Stuff Remover retails at £7.99 for the 1-litre bottle, and £18.99 for the 5-litre concentrate, and is available from www.powermaxed.com ENDS. Print article This entry was posted by admin on August 30, 2018 at 4:47 pm, and is filed under News. Follow any responses to this post through RSS 2.0. Both comments and pings are currently closed.